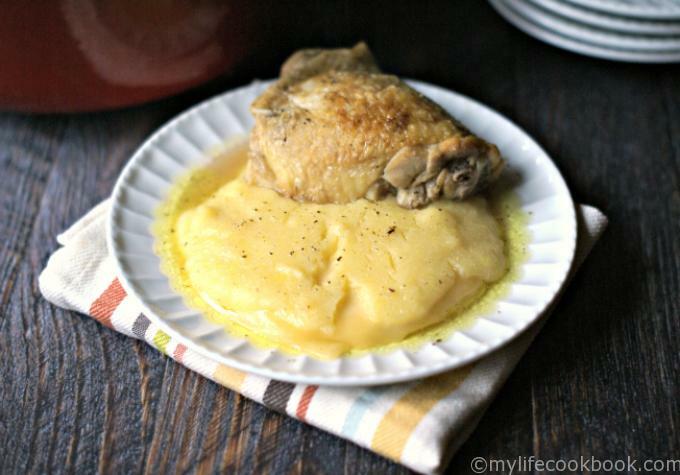 Chicken with polenta and bagna is an old family recipe that is perfect on cold winter days. Butter, sage and chicken broth make a tasty bagna to go with the creamy polenta and cheese. My MIL always tells people she is FBI — full blooded Italian. She has a lot of interesting stories about her childhood and growing up with 9 brothers and sisters. Can you imagine? She also has a lot of unusual recipes like sticky cheese, bagna cauda and stuffed raw peppers. 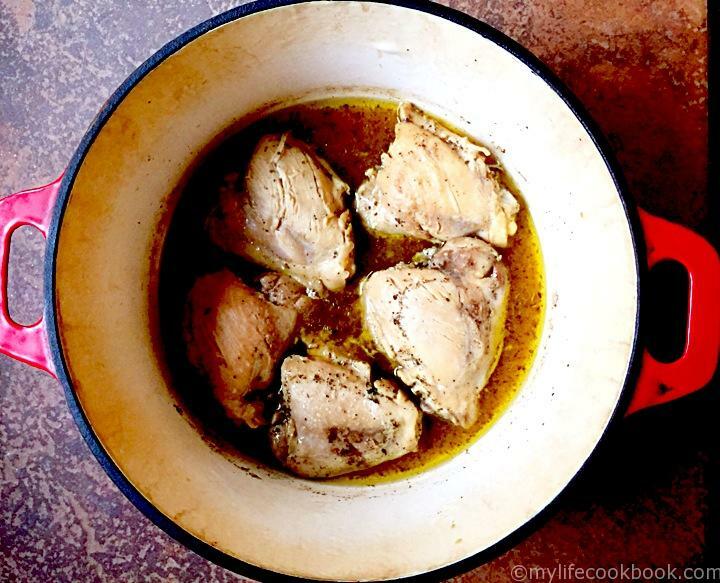 This dish is one of my family’s favorites when it’s cold outside and you want something that will stick to your bones. I believe my MIL’s family used to eat rabbit with their polenta instead of the chicken but I’m not that adventurous yet. The polenta is soft with a layer of cheese in the middle (brick or blue cheese) and topped with the stock from the chicken (bagna). 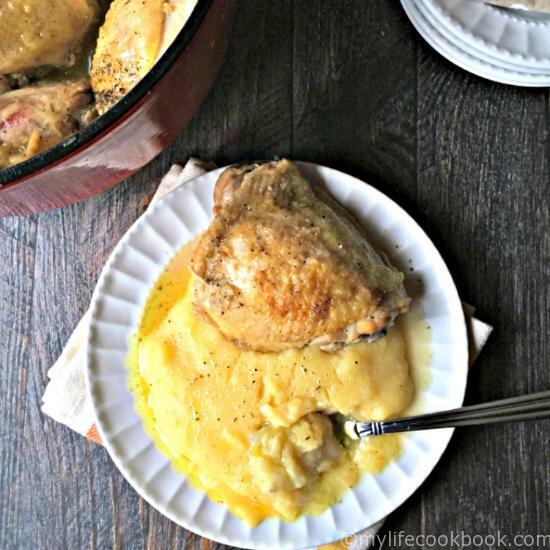 It’s one of those recipes we can make anytime since I always have chicken in the freezer and cornmeal in the cupboard. Polenta —> Cheese —> Polenta —>Bagna —> Chicken on the side. This was the first polenta dish I’ve ever had and it’s going to be hard to beat. It’s very cold here in Pittsburgh today and it seemed the perfect day for a plate of Penny’s polenta. I hope you like it as much as we do. Enjoy! 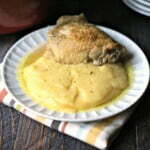 Chicken with polenta and bagna is an old family recipe that is perfect on cold winter days. Butter, sage and chicken broth make a tasty bagna to go with the creamy polenta and cheese. In a dutch over or large pot, heat the olive oil. Salt and pepper your chicken thighs and brown in the pan. Next add butter, broth and sage. Cover and cook until the chicken is done 20-30 minutes on medium. minutes before serving make the polenta. Follow the directions on the container. To assemble, add a small mound of polenta to your plate. Top with cheese then add another layer of polenta. Ladle some of the bagna (sauce from the chicken) on top. Serve with a piece of the chicken. I’m totally in love with this! Yummy! Pinned and tweeted. We appreciate you being a part of our party, and I hope to see you on tonight at 7 pm. We love partying with you! Saw this on Retro Repin. My grandfather was from Northern Italy so I was introduced to polenta early in life. Love it! I’d never heard of bagna before but I do serve chicken this way, just didn’t know it had a name. Honestly Audrey, I’m guessing on that one…my MIL doesn’t know any Italian but her parents both came over from there and that’s what she calls it. Oh yum, this looks like one of those hearty meals that the whole family can enjoy.